I like to think of myself as a deep conditioning connoisseur because I love to deep condition my hair. I deep condition weekly for the health of my hair and also because I enjoy it. I love trying different types of deep conditioners on my hair, so when I found out there was a new brand on the block who specialized in deep conditioning, I had to try out their latest product! Especially Hair was founded from the necessity, by a mom who was struggling to comb her daughter’s hair after swim practice. She searched for several products, but none of them worked, so she decided to create her own. She needed a product that helped to moisturize, condition and detangle the hair all-in-one, and Especially Hair was then created. Especially Hair is known know for using select renewable raw materials that are sustainably sourced in both the formulations and the packaging. 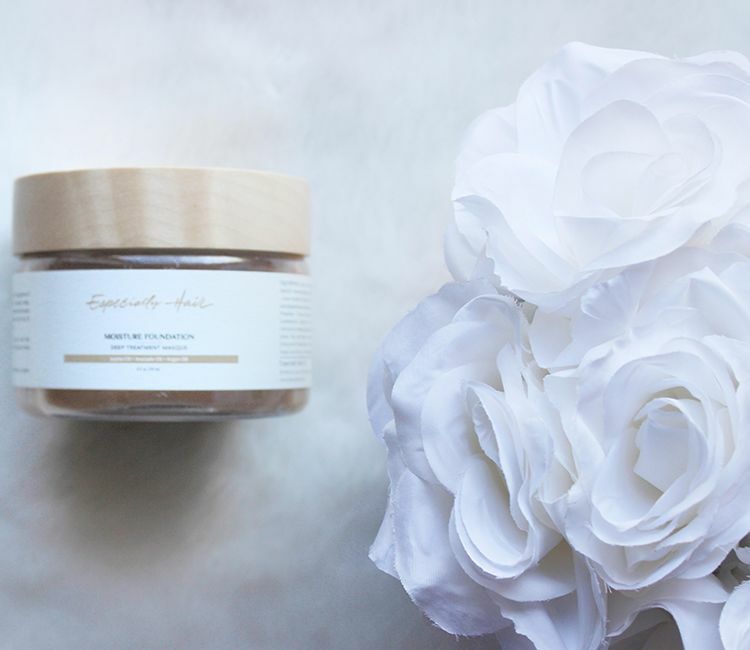 Especially Hair’s Moisture Foundation is a multi-purpose deep treatment that may be used as a leave-in conditioner or rinse-out masque. It is labeled as ideal for all curl types, especially Type 3s and 4s. It aims to repair damage from heat styling, chemicals, and UV rays. Moisture Foundation says that you can accomplish detangling and deep conditioning in 15 minutes or less. This product can also be used for our curly men out there too. Especially Hair contains a mix of humectants and also natural oils that will leave the hair feeling healthy and soft. The products are very easy to use, even for the guys. I was a little concerned with the consistency of this product. It seemed like it was going to clump together and not penetrate my hair. I have a hard time with moisture, so I need a product that will penetrate my hair and just not sit on top. The smell is really clean, and light and the packaging is beautiful. The top looks to be made of wood, something I have never seen with hair products before. I am glad that I don’t judge a book by its cover (or consistency) because this product did end up penetrating my hair strand. My hair felt very moisturized after use, and it was easier to manage and detangle. Especially Hair aims to provide you with products that allow living the best lifestyle that fits you. This product will work on natural and relaxed hair. You can use it for wash and go’s, heat styling or both. You can swim without worrying about how you will take care of your hair after. As someone who strugglrs to maintain moisture I appreciate that Especially Hair focuses on moisture first. Have you tried Especially Hair? We'd love to hear what you think of them in the comments.